There is a thing called “Second Sock Syndrome”. I hadn’t heard about it until about a year ago. Apparently there are people who, after finishing a sock, procrastinate about knitting the second one. This is a problem since most people come equipped with two feet and appreciate wearing a sock on each of them, preferably matching ones. So there seem to be knitters out there who have a mountain of single socks at home. There are even self-help groups where people send each other single socks and the rest of the yarn and make the second sock for somebody else. That is not a problem of mine. I’m always happy to find problems that I don’t have in addition to the ones I do have – it makes me feel a bit less, well, problematic. The problem I do have is something I have decided to call “Third Sock Syndrome”. This problem also had been unknown to me until about a year ago (and I really might be the only knitter suffering from it). It started when I made my first pair of socks following a pattern. Until then all I had knit were socks that we Germans call “Stinos” (when I was a young knitter we didn’t call them Stinos by the way, we called them “Socken”). “Stinos” is short for “stinknormale Socken” which means socks that are so ordinary that they practically reek ordinariness. You don’t need a written pattern for “Stinos” you get shown how to do them by relatives or friends, and they are done following a formula. (Be glad because I just edited that whole formula out of the post so you don’t have to read through it.) That formula-aspect means that you can knit them in all sizes with any ribbing or cabling or colors you like. Since they are so easy to produce there is nothing like this fancy “swatching” and such, you just eye somebody’s feet, go like “It looks like his feet are a bit bigger than mine.” and cast on any number of stitches that feel right. Then you just knit on until you have reached the tip of that person’s little toe (at which point you let that person try on the unfinished sock – you better don’t believe it when people are telling you that you can’t try on a cuff-down sock on double-pointed needles) and make a toe. 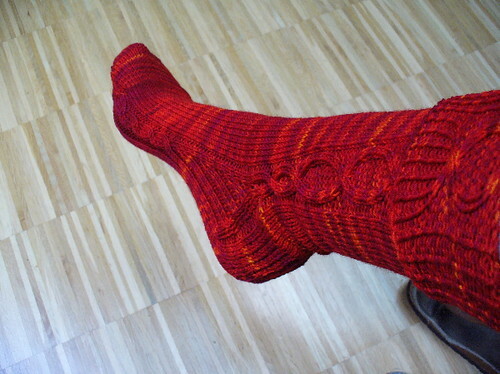 But since I like both a challenge and pretty socks I started knitting socks from designer patterns. With different heels and short rows, socks knitted toe-up, with all sorts of lace, and cables, and whatnot. Since then I have developed third sock syndrome which means for every pair of socks that I make I have to knit the equivalent of about three socks. Often more. Take that sock I’m currently working on right now. 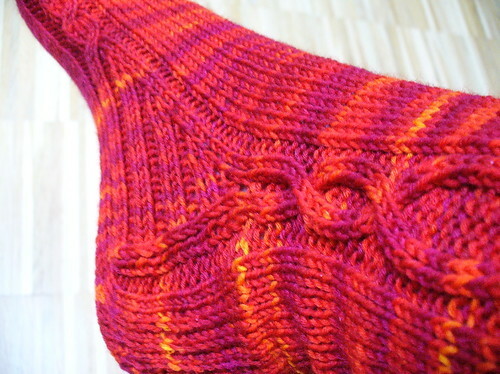 The pattern is absolutely gorgeous by Yarnissima, one of my very favorite sock designers. I bought the pattern, pulled out some Wollmeise yarn, wound it into a ball and started knitting, all in a continuous, fluid motion, regardless of the fact that until then I was frantically working on two cardigans and a lace shawl at the same time. 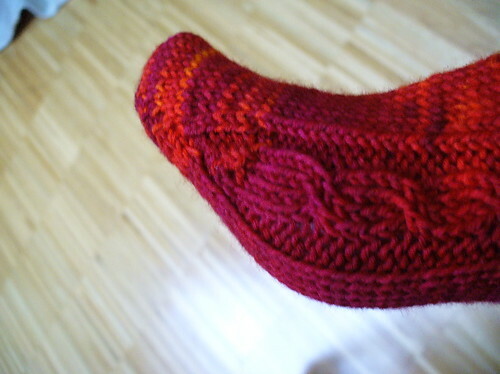 I got a bit frustrated by the toe but that’s only to be expected in a toe-up sock, they start out fiddly. Everything went fine, I often stopped to admire my nice, shiny new sock, I managed to turn the heel without much fuss, then I tried on the sock and – it was too short. Ugh. I had to rip back the entire heel and gusset in order to make it longer. I calmed myself by telling me that it was all for the best, I wouldn’t want a sock that’s too short, and the second time I really got the hang of the gusset, and it looks much better. I didn’t like the toe that much though because the cabling started a little later than I would have liked but since I followed the pattern, surely everything would turn out right. I knit on, enjoying myself tremendously. Oh, and the too short foot? That’s the thing that happens when you decide to knit the sock in the smallest size so that your socks won’t turn out too wide without compensating for the fact that while your foot’s circumference might be small, the length of your foot is not. Duh. I knit on and on, and didn’t make a lot of mistakes, even when I knit on the train at 11.30 pm after three beers. I had a bit of a trouble with the start of the cuff because I couldn’t figure it out at first, which meant that I knit one round, thought a bit, un-knit it again because I thought it was wrong, thought a bit more, knit half of it in the other direction, finally got it, and knit it again exactly the same way I had done it the first time. But that’s not a problem. Things like that happen all the time in knitting. Maybe I should put a sign on my knitting bag(s) “Think before ripping.” (And another one that says, “Just do as the pattern tells you to.”) but I was okay with that. Then I saw it: I forgot to cross the cables after the gusset. It looks unpleasant. I really don’t like it. Could I live with a mistake like that? I looked at the very, very long sock, almost finished, I looked at the missing cable. I thought about how that part will be hidden by my shoes anyway (not to mention that the whole of the sock will be hidden by my shoes and pants but that can’t be helped). I looked at the sock again. I finished it and bound off. Today I cast on for the second sock. (See, I told you that I don’t have second sock syndrome.) I fiddled with the provisional crocheted cast-on. I did it for the first time in my life, and it will certainly be the last time. Apart from the fact that it takes three times as long as my usual provisional cast-on, it also requires me to find a crochet hook and waste yarn. Nah, I won’t do that again. So, I started the toe, and then I got to the part in the instructions that said “knit row 4 of chart 1” and suddenly it hit me: That didn’t mean knitting row 4 of chart 1 and then starting with row 1 of chart 1 in the following row, no, it probably meant knitting rows 4 to 6 before starting row 1. No wonder the toe of my first sock looked too un-cabled. I had started the crossing of the cables four rows too late. Even that I could have stomached but now I want to do the second sock the way it should be done. Which means that apart from it being nicer looking, and more cabled, it also will be four rows longer. Which would make it the perfect length since the first sock is still a bit too short. But now, do you see what that means? And that also is the answer to the question of “How do you manage to knit all these nice things?” It’s easy. I just don’t give up. Socks. A metaphor for life.